Mandy kicked off our 4-part blog series last week with an inaugural post that provided background and context for this project, which centers around a specific challenge faced by many qualitative researchers: lack of qualitative methods training. This post offers some concrete ideas to data-support professionals on how to leverage library collections and other information sources that direct researchers to secondary and tertiary sources on qualitative methods to address this issue. Possibly the most basic yet high-impact way to bridge the gap between researchers and qualitative methods is to create a LibGuide—or any other online research guide or pathfinder—dedicated to qualitative research resources. It can be embedded within an existing resource, such as a library’s Data Services page or a course-specific guide, or it can exist as an independent guide unto itself. Now, I know what you’re thinking: when faced with an instructional or research need, a librarian’s knee-jerk reaction is often, “Let’s make a LibGuide!” While research guides aren’t necessarily appropriate for every topic or service we provide as information and data specialists (i.e., LibGuides aren’t a panacea, per se), they can be a useful didactic medium for culling and delivering information and resources specific to qualitative research methods. Online research guides, like LibGuides, allow researchers to benefit from the guidance and expertise of a data-support professional in an autonomous, self-paced manner. This type of learning object is well-suited for researchers who fit the profile Mandy described in her introductory post for this series: those who aren’t getting formal qualitative methods training and need to get up to speed quickly on their own, and/or researchers with varying degrees of qualitative methods knowledge and experience who would like a set of materials, sources, and resources to which they can refer back periodically. The portability of a LibGuide also makes it convenient for use by data-support professionals in mediated settings, such as consultations or instruction sessions. And at institutions where demand for research methods and tools training outstrips an individual or staff’s capacity to provide one-on-one or even course-embedded support, a LibGuide can solve the scalability problem for a large and diverse set of needs (although, obviously, not all of them). Lastly, LibGuides aren’t just for researchers; they also serve to assist colleagues and fellow information and data specialists in providing reference and research services at an institution (and beyond) and are an effective tool for cross-training. This last point is relevant especially for fairly specialized, niche areas of expertise, like qualitative research methods. A number of qualitative research guides already exist and are worth checking out (e.g., Duke University Libraries’ guide on Qualitative Research by Linda Daniel, UCSF Library’s Qualitative Research Guide by Evans Whitaker). Below are some suggestions for content to include—with a focus on resources related to learning about qualitative methods—if one were to consider creating anew or building on an existing qualitative research guide. As a companion, it may be useful to link to relevant catalogs and social-sciences databases to search for additional literature and research. However, not all catalogs and bibliographic databases index research methods, and even those that do often don’t index qualitative methods with appropriate granularity. Thus, it may be necessary to provide tips on how best to search for studies that employ qualitative methods (e.g., NYU Libraries’ guide on Locating Qualitative Research by Susan Jacobs). This way, a guide delivers select sources but also teaches users how to find additional methods-related sources themselves. While not specific to research methods, Credo is a multidisciplinary, searchable collection of digitized reference works (e.g., dictionaries, encyclopedias, and handbooks) that provide helpful background information on a topic but also act as springboards to connect users to further readings and cross-references. Credo can serve as a good starting point for researchers looking to learn more about qualitative methods in general or about a particular methodology. SRM is an online multimedia collection devoted to research methods (qualitative and quantitative), with a special emphasis on research skills training. It includes e-versions of SAGE’s Little Blue Books, an instructional series on qualitative research methods, as well as many other searchable, full-text interdisciplinary SAGE reference and journal sources that allow users to deep-dive into a particular method at each stage of the research lifecycle. SRM also provides resources for teaching qualitative methods, including case studies, sample datasets, and instructional videos. OBO offers access to online, peer-reviewed, annotated bibliographies that are organized by discipline and are written by experts in their fields. One can find entire bibliographies or portions of a bibliography dedicated to qualitative methods in a given field of social science (e.g., sociology, political science) or to a particular qualitative methodology (e.g., anthropology, education). This makes OBO a good source of information for discipline-specific qualitative research methods. In addition to researchers, these resources can be indispensible to data-support professionals who are asked to consult on research projects using qualitative methods outside their own specializations, or who are asked to consult with researchers who sit in (or between) disciplines with which they are less familiar or comfortable. I hope you have enjoyed my suggestions in this post! They are by no means exhaustive. I would love to here what you think, what you would add, or what you’re already using on your guides to address the qualitative methods gap discussed in this series of blog posts. We welcome comments here, emails to the IASSIST listserv, the QSSHDIG google group, or directly to the authors, and/or comments in this “Blog Conversations” doc embedded in the QSSHDIG website. Also, there's a section at the bottom of the "Blog Conversations" doc for suggesting future QSSDHIG posts - please do! Stayed tuned for Part 3 of our blog series next week when Mandy Swygart-Hobaugh will share ideas for developing and providing training resources in collaboration with faculty and academic departments that are mindful of the qualitative methods gap. The IASSIST Qualitative Social Science & Humanities Data Interest Group (QSSHDIG) was created in October 2016, its central purpose: to foster conversations regarding the needs of researchers who generate qualitative data, and what types of services librarians and other information professionals can develop to support these researchers in managing their data/source materials throughout the research lifecycle. To foster conversation, we welcome comments here, emails to the IASSIST listserv, the QSSHDIG google group, or directly to the authors, and/or comments in this “Blog Conversations” doc embedded in the QSSHDIG website. Also, there's a section at the bottom of the "Blog Conversations" doc for suggesting future QSSDHIG posts - please do! they are in an interdisciplinary academic program without a strong research methods training component. Those of us who offer training sessions on qualitative data analysis software (such as NVivo, Atlas.ti, Quirkos, or Dedoose) often experience researchers coming to these sessions without the methodological background to *do* qualitative research or understand what the software can/cannot do for them - sometimes hoping that the software will have the “magic button” to solve their lack of training. Similarly, as social science liaison librarians we often witness this qualitative methods gap during our research consultations. Although this dilemma of lack of methods training is not unique to qualitative research (i.e., researchers lacking quantitative research training are known to attend statistical software training sessions), when compared to their quantitative counterparts, qualitative researchers often have less resources for support and for building necessary skills. Issue 40(3) is now online at http://www.iassistdata.org/iq/issue/40/3. Being international - and proud of it! IASSIST is proud of being international. These days some us of find it important to emphasize how international collaboration has improved and made our lives more efficient. In the small but around-the-globe-reaching world of IASSIST, many national data archives have come into existence as well as continuing their development, through friendly international support and spreading of knowledge and good practices among IASSISTers. So let us cherish the 'International' in IASSIST. We are proud of the lead 'I' for 'International' in the IASSIST acronym and have no intention of changing that to 'N' for 'National'. It is also my impression that data archives all over the world simply don't have the facilities for storing 'alternative facts' as they are shy of all kinds of documentation. Welcome to the third issue of Volume 40 of the IASSIST Quarterly (IQ 40:3, 2016). Four papers with authors from three continents are presented in this issue. The paper 'Demonstrating Repository Trustworthiness through the Data Seal of Approval' is a summary of a panel session at the IASSIST 2015 conference in Minneapolis with panel members Stuart Macdonald, Ingrid Dillo, Sophia Lafferty-Hess, Lynn Woolfrey, and Mary Vardigan. The paper has an introduction from DANS in the Netherlands where the Data Seal of Approval (DSA) originated. Cases from the US and South Africa are presented and the future of the DSA including possible harmonization with other systems is discussed. DSA certifications are basically consumer guidance, clearly assisting all the involved parties. Depositors and funding bodies will be assured that data are reliably stored, researchers can reliably access the data repositories, and repositories are supported in their work of archiving and distribution of data. The second article brings us to the actual use of data. From the UK Data Service, Rebecca Parsons and Scott Summers in 'The Role of Case Studies in Effective Data Sharing, Reuse and Impact' take us into positive narratives around secondary data. The background is that although the publishing of data is now recognised by funders, the authors find that ‘showcasing’ brings motivation for data sharing and reuse as well as improving the quality of data and documentation. The impact of case studies is all-sided and research, depositing data, and the brand recognition of the UK Data Service are among the areas investigated. The future is likely to include new case studies developed for use in teaching in schools, with easy linking to datasets, as well as for researchers being assisted to build their own portfolios. The appendix presents case studies on research and impact. In the third article, we are situated in data creation. Muhammad F. Bhuiyan and Paula Lackie from Carleton College in Minnesota write on 'Mitigating Survey Fraud and Human Error: Lessons Learned from A Low Budget Village Census in Bangladesh'. As the 'fraud' term implies, they are looking into the problem of data creators being too creative, but more importantly they are investigating the essential area of data quality. The authors explain how selected technological assets like the use of geographic information systems (GIS) and audio-capturing smart pens improved data quality. The use of these tools is exemplified through many scenarios described in the paper. Furthermore, a procedure of daily monitoring and fast transcription lead to quick surveyor re-training and dismissal of others, thus minimising data errors. For those interested in false data and its detection, the introduction in particular has valuable references to literature. In the last paper the difficult task of handling images is addressed in 'Image Management as a Data Service' by Berenica Vejvoda, K. Jane Burpee, and Paula Lackie. Vejvoda and Burpee work at McGill University in Montreal. You have already met Lackie from Carleton College in relation to the third paper above. The 'images' in the article are digital images, and the authors suggest that the knowledge of digital data services across the 'research data lifecycle' also benefits the management of digital images. Digital images are numerical data, and the article compares the data, metadata, and paradata of a survey respondent to the information on a digital image. Considerations from normal data concerning system formats and storage space also apply to management of images. In the last section the paper introduces copyright issues that are complicated, to say the least. Just as reuse of normal data can have ethical angles, it is even more apparent that images can have complicated issues of privacy and confidentiality. Papers for the IASSIST Quarterly are always very welcome. We welcome input from IASSIST conferences or other conferences and workshops, from local presentations or papers especially written for the IQ. When you are preparing a presentation, give a thought to turning your one-time presentation into a lasting contribution. We permit authors 'deep links' into the IQ as well as deposition of the paper in your local repository. Chairing a conference session with the purpose of aggregating and integrating papers for a special issue IQ is also much appreciated as the information reaches many more people than the session participants, and will be readily available on the IASSIST website at http://www.iassistd ata.org. Authors can also contact me via e-mail: kbr@sam.sdu.dk. Should you be interested in compiling a special issue for the IQ as guest editor(s) I will also be delighted to hear from you. The IASSIST Liaison and Organizational Sponsorship Task Force is seeking proposals for sponsorships of regional or local events during calendar year 2017. In this second round of sponsorships we will be awarding up to four grants of $500 USD each, but requests for any amount up to $500 USD will be considered. The goal of these sponsorships is to support local networks of data professionals and data-related activities across the globe in order to help support IASSISTers activities throughout the year and increase awareness of the value of IASSIST membership. Events should be a gathering of data professionals from multiple institutions and may vary in size and scope from workshops, symposia, conferences, etc. These may be established events or new endeavors. We are particularly looking to sponsor regional or local level events that will attract data professionals who would benefit from IASSIST membership, but may not always be able to travel to attend IASSIST conferences. Preference will be given to events from geographic areas outside of traditional IASSIST conference locations (North America and Western Europe), and from underrepresented membership areas as such as Latin/South America, Africa, Asia/Pacific, and Eastern Europe. Requests for sponsorships may be monetary, and may also include a request for mentorship assistance by matching the event planning committee with an experienced IASSIST member with relevant expertise (e.g., conference planning, subject/content, geographic familiarity). Accepted events will be required to designate an active IASSIST member as the liaison. Generally, this would be an IASSIST member who will be attending the event and although not required, may be on the planning committee or otherwise contributing to the event. The liaison will be responsible for assistance with coordinating logistics related to the sponsorship, ensuring that the sponsorship is recognized at the event, and contributing a post to the IASSIST iBlog about the event. Proposals are due on Friday, June 30 2017 via the Application Form. Notification of sponsorship awards will be by July 21 2017. The number and monetary extent of awarded sponsorships will depend on the number and quality of applications received within a total budgeted limit. Individual sponsorship requests may range from $0 USD (request for mentorship only) to $500 USD. Please direct questions to Jen Doty, IASSIST Membership Chair (jennifer.doty@emory.edu). The Qualitative Social Science and Humanities Data Interest Group (QSSHDIG) was formed in fall 2016. We decided to focus our efforts on the conference this year. We have some continuing projects planned for next year. We are meeting at the conference on Tuesday, May 22 at 4pm in the Oread Lobby. We are developing a blog post series on the challenges of balancing teaching/providing resources for qualitative *software* against teaching/providing resources for qualitative methods. Mandy is currently leading that effort. We have been working on developing a LibGuide compiling qualitative and humanities data resources (e.g., finding data sources, analysis tools, etc.). We are gathering some resources now and will talk more about this at our group meeting tomorrow. Lynda is leading this effort. We also have an email list for everyone interested in Qualitative Social Science or Humanities Data research. We would love to have any members help out with these efforts. If you are interested, please email Lynda or Mandy. At the meeting in Bergen (review notes) we discussed the merits of an IASSIST geospatial interest group in relation to existing groups (e.g. ALA), recommending geospatial resources and tools for institutions with limited resources available to support GIS, and whether the interest group needs to be laser focused on the social sciences. As a result of the discussions, we developed lists of resources and tools, which are not exhaustive. For communication we established a Google Group, but traffic has been light. In 2017/2018 the group may explore a more effective communication tool. A version of this post originally appeared on the NYU Data Dispatch blog. Data rescue efforts began in January 2017, and over the past few months many institutions hosted hack-a-thon style events to scrape data and develop strategies for preservation. The Environmental Data & Governance Initiative (EDGI) developed a data rescue toolkit, which apportioned the challenge of saving data by distinct federal agency. We've had a number of conversations at NYU and with other members of the library community about the implications of preserving federal data and providing access to it. The efforts, while important, call attention to a problem of organization that is very large in scope and likely cannot be solved in full by libraries. Thus far, the divide-and-conquer model has postulated that individual institutions can "claim" a specific federal agency, do a deep dive to root around its websites, download data, and then mark the agency off a list as "preserved." The process raises many questions, for libraries and for the data refuge movement. What does it mean to "claim" a federal agency? How can one institution reasonably develop a "chain of custody" for an agency's comprehensive collection of data (and how do we define chain of custody)? How do we avoid duplicated labor? Overlap is inevitable and isn't necessarily a bad thing, but given the scope of the challenge, it would be ideal to distribute efforts so as to benefit from the hard work of metadata remediation that all of us will inevitably do. These questions suggest even more questions about communication. How do we know when a given institution has preserved federal data, and at what point do we feel ready as a community to acknowledge that preservation has sufficiently taken place? Further, do we expect institutions to communicate that a piece of data has been published, and if so, by what means? What does preservation mean, especially in an environment where data is changing frequently, and what is the standard for discovery? Is it sufficient for one person or institution to download a file and save it? And when an institution claims that it has “rescued” data from a government agency, what commitment does it have to keep up with data refreshes on a regular basis? An example of an attempt to engage with these issues is Stanford University’s recent decision to preserve the Housing and Urban Development spatial datasets, since they were directly attacked by Republican lawmakers. 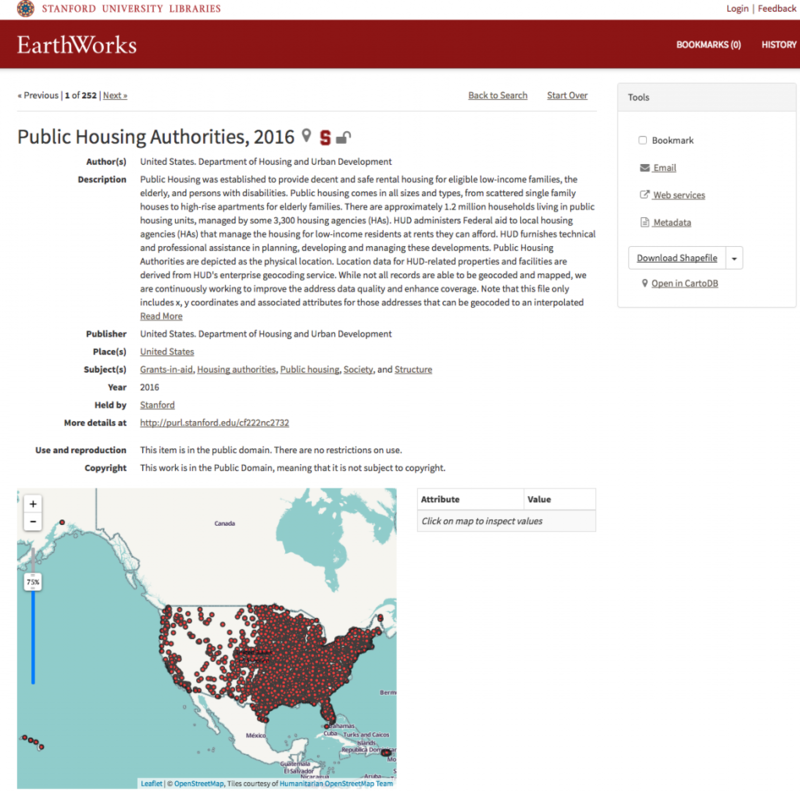 Early in the Spring 2017 semester, Stanford downloaded all of HUD's spatial data, created metadata records for them, and loaded them into their spatial discovery environment (EarthWorks). We can see from the timestamp on their metadata record that the files were added on March 24, 2017. Stanford's collection process is very robust and implies a level of curation and preservation that is impressive. As colleagues, we know that by adding a file, Stanford has committed to preserving it in its institutional repository, presenting original FGDC or ISO 19139 metadata records, and publishing their newly created records to OpenGeoMetadata, a consortium of shared geospatial metadata records. Furthermore, we know that all records are discoverable at the layer level, which suggests a granularity in description and access that often is not present at many other sources, including Data.gov. However, if I had not had conversations with colleagues who work at Stanford, I wouldn't have realized they preserved the files at all and likely would've tried to make records for NYU's Spatial Data Repository. Even as they exist, it's difficult for me to know that these files were in fact saved as part of the Data Refuge effort. Furthermore, Stanford has made no public claim or longterm "chain of custody" agreement for HUD data, simply because no standards for doing so currently exist. Data collected as part of the #DataRefuge initiative will be stored in multiple, trusted locations to help ensure continued accessibility. [...]DataRefuge acknowledges--and in fact draws attention to--the fact that there are no guarantees of perfectly safe information. But there are ways that we can create safe and trustworthy copies. DataRefuge is thus also a project to develop the best methods, practices, and protocols to do so. Each institution has specific curatorial needs and responsibilities, which imply choices about providing access to materials in library collections. These practices seldom coalesce with data management and publishing practices from those who work with federal agencies. There has to be some flexibility between community efforts to preserve data, individual institutions and their respective curation practices. "That's Where the Librarians Come In"
NYU imagines a model that dovetails with the Data Refuge effort in which individual institutions build upon their own strengths and existing infrastructure. We took as a directive some advice that Kimberly Eke at Penn circulated, including this sample protocol. We quickly began to realize that no approach is perfect, but we wanted to develop a pilot process for collecting data and bringing it into our permanent geospatial data holdings. The remainder of this post is a narrative of that experience in order to demonstrate some of the choices we made, assumptions we started with, and strategies we deployed to preserve federal data. Our goal is to preserve a small subset of data in a way that benefits our users and also meets the standards of the Data Refuge movement. We began by collecting the entirety of publicly accessible metadata from Data.gov, using the underlying the CKAN data catalog API. This provided us with approximately 150,000 metadata records, stored as individual JSON files. Anyone who has worked with Data.gov metadata knows that it’s messy and inconsistent but is also a good starting place to develop better records. Furthermore, the concept of Data.gov serves as an effective registry or checklist (this global metadata vault could be another starting place); it's not the only source of government data, nor is it necessarily authoritative. However, it is a good point of departure, a relatively centralized list of items that exist in a form that we can work with. That search generated 6,353 records that are extremely likely to contain geospatial data. From that search we yielded a subset of records and then transformed them into a .CSV. The next step was to filter down and look for meaningful patterns. We first filtered out all records that were not from federal sources, divided categories into like agencies, and started exploring them. Ultimately, we decided to rescue data from the Department of Agriculture, Forest Service. This agency seems to be a good test case for a number of the challenges that we’ve identified. We isolated 136 records and organized them here (click to view spreadsheet). However, we quickly realized that a sizable chunk of the records had already somehow become inactive or defunct after we had downloaded them (shaded in pink), perhaps because they had been superseded by another record. For example, this record is probably meant to represent the same data as this record. We can't know for sure, which means we immediately had to decide what to do with potential gaps. We forged ahead with the records that were "live" in Data.gov. Not everything in Data.gov points to an actual dataset. Often, records can point to other portals or clearinghouses of data that are not represented within Data.gov. We ultimately decided to omit these records from our data rescue effort, even if they point to a webpage, API, or geoservice that does contain some kind of data. The approach to establishing order on Data.gov is inconsistent. Most crucially for us, there is not a one-to-one correlation between a record and an individual layer of geospatial data. This happens frequently on federal sites. For instance, the record for the U.S. Forest Service Aerial Fire Retardant Hydrographic Avoidance Areas: Aquatic actually contains eight distinct shapefile layers that correspond to the different regions of coverage. NYU’s collection practice dictates that each of these layers be represented by a distinct record, but in the Data.gov catalog, they are condensed into a single record. Not all data providers publish records for data on Data.gov consistently. Many agencies point to some element of their data that exists, but when you leave the Data.gov catalog environment and go to the source URL listed in the resources section of the record, you’ll find even more data. We had to make decisions about whether or not (and how) we would include this kind of data. It’s very common that single Data.gov metadata records remain intact, but the data that they represent changes. 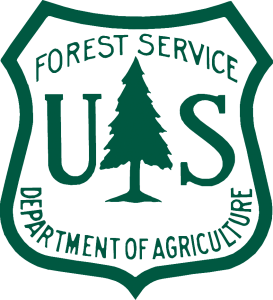 The Forest Service is a good example of this, as files are frequently refreshed and maintained within the USDA Forestry geodata clearinghouse. We did not make any effort in either of these cases to track down other sets of data that the Data.gov metadata records gesture toward (at least not at this time). Relatedly, we did not make attempts to provide original records for different formats of what appeared to be the same data. In the case of the Forest Service, many of the records contained both a shapefile and a geodatabase, as well as other original metadata files. Our general approach was to save the shapefile and publish it in our collection environment, then bundle up all other "data objects" associated with a discrete Data.gov record and include them in the preservation environment of our Spatial Data Repository. Finally, we realized that the quality of the metadata itself varies widely. We found that it’s a good starting place to creating metadata for discovery, even if we agree that a Data.gov record is an arbitrary way to describe a single piece of data. However, we had to clean the Data.gov records to adhere to the GeoBlacklight standard and our own internal cataloging practices. Some of the revisions to the metadata are small and reflect choices that we make at NYU (these are highlighted in red). For instance, the titles were changed to reflect a date-title-area convention that we already use. Other fields (like Publisher) are authority controlled and were easy to change, while others, like format and provenance, were easy to add. For those unfamiliar with the GeoBlacklight standard, refer to the project schema pages and related documentation. Many of the metadata enhancements are system requirements for items to be discovered within our Spatial Data Repository. Subjects presented more of a problem, as these are drawn from an informal tagging system on Data.gov. We used an elaborate process of finding and replacing to remediate these subjects into the LCSH Authority, which connects the items we collect into our larger library discovery environment. The most significant changes are in the descriptions. We preserved the essence of the original Data.gov description, yet we cleaned up the prose a little bit and added a way to trace the item that we are preserving back to its original representation in Data.gov. In the case of aforementioned instances, in which a single Data.gov record contains more than one shapefile, we generated an entirely new record and referenced it to the original Data.gov UUID. Libraries' ability to represent precisely and accurately which datasets, or components of datasets, have been preserved is a serious impediment to embarking on a distributed repository / data-rescue project. Further, libraries need to know if data objects have been preserved and where they reside. To return to the earlier example, how is New York University to know that a particular government dataset has already been "rescued" and is being preserved (either via a publicly-accessible repository interface, or not)? Moreover, even if there is a venue for institutions to discuss which government datasets fall within their collection priorities (e.g. "New York University cares about federal forestry data, and therefore will be responsible for the stewardship of that data"), it's not clear that there is a good strategy for representing the myriad ways in which the data might exist in its "rescued" form. Perhaps the institution that elects to preserve a dataset wants to make a few curatorial decisions in order to better contextualize the data with the rest of the institution's offerings (as we did with the Forest Service data). These types of decisions are not abnormal in the context of library accessioning. The problem comes when data processing practices of an institution, which are often idiosyncratic and filled with "local" decisions to a certain degree, start to inhibit the ability for individuals to identify a copy of a dataset in the capacity of a copy. There is a potential tension between preservation –– preserving the original file structure, naming conventions, and even level of dissemination of government data products –– and discovery, where libraries often make decisions about the most useful way for users to find relevant data that are in conflict with the decisions exhibited in the source files. For the purposes of mitigating the problem sketched above, we propose a data store that can be drawn upon by all members of the library / data-rescue community, whereby the arbitrary or locally-specific mappings and organizational decisions can be related back to original checksums of individual, atomic, files. File checksums would be unique identifiers in such a datastore, and given a checksum, this service would display "claims" about institutions that hold the corresponding file, and the context in which that file is accessible. New York University, as part of an intentional data rescue effort, decides to focus on collecting and preserving data from the U.S. Forest Service. They are available directly from a geoservices or FTP endpoint maintained by the Forest Service (such as here). NYU wants a way to grab all of the documents from the Forest Service that it is aware of and make those documents available in an online repository. The question is, if NYU has made organizational and curatorial decisions about the presentation of documents rescued, how can it be represented (to others) that the files in the repository are indeed preserved copies of other datasets? If, for instance, Purdue University comes along and wants to verify that everything on the Forest Service's site is preserved somewhere, it now becomes more difficult to do so, particularly since those documents never possessed a canonical or authoritative ID in the first place, and even could have been downloaded originally from various source URLs. The file with checksum 8a53c3c191cd27e3472b3e717e3c2d7d979084b74ace0d1e86042b11b56f2797 appears in as a component of the document instituton_a_9876... held by New York University. Assuming all checksums are computed at the lowest possible level on files rescued from Federal agencies (i.e., always unzip archives, or otherwise get to an atomic file before computing a checksum), such a service could use archival manifest data as a way to signal to other institutions if a file has been preserved, regardless of whether or not it exists as a smaller component of a different intellectual entity –– and it could even communicate additional data about where to find these preserved copies. In the example of the dataset mentioned above, the original Data.gov record represents 8 distinct resources, including a Shapefile, a geodatabase, an XML metadata document, an HTML file that links to an API, and more. For the sake of preservation, we could package all of these items, generate checksums for each, and then take a further step in contributing our manifest to this hypothetical datastore. Then, as other institutions look to save other data objects, they could search against this datastore and find not merely checksums of items at the package level, but actually at the package component level, allowing them to evaluate which portion or percentage of data has been preserved. A system such as the one sketched above could efficiently communicate preservation priorities to a community of practice, and even find use for more general collection-development priorities of a library. Other work in this field, particularly that regarding IPFS, could tie in nicely –– but unlike IPFS, this would provide a way to identify content that exists within file archives, and would not necessitate any new infrastructure for hosting material. All it would require is for an institution to contribute checksum manifests and a small amount of accompanying metadata to a central datastore. Even though our rescue of the Forest Service data is still in process, we have learned a lot about the challenges associated with this project. We’re very interested in learning about how other institutions are handling the process of rescuing federal data and look forward to more discussions at the event in Washington D.C. on May 8. New to IASSIST or Willing to Mentor Someone New? We are excited to have new members in IASSIST. IASSIST is a home for data services professionals across many disciplines: librarians, data archivists, open data proponents, data support staff, etc. 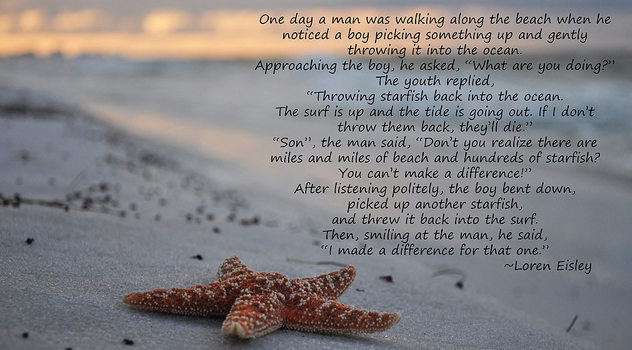 For some, it is an organization where you don’t have to explain what you do because our members already understand. We get metadata, data support, data access issues, database challenges, the challenge of replication and so much more! Although we are a long-established organization, new members are the lifeblood of IASSIST! If you have any questions, please contact Bobray Bordelon (bordelon@princeton.edu). Thank you for participating & see you in Lawrence, Kansas! For the third time IASSIST sponsored the International Digital Curation Conference. This time allowing three students, one each from Switzerland, Korea, and Canada to attend the conference, which titled itself "Upstream, Downstream: embedding digital curation workflows for data science, scholarship and society". Data science was a strong theme of the three keynote presentations, in particular how curation and data management are an active, integrated, ongoing parts of analysis rather than a passive epilogue in research. Maria Wolters talked about how missing data can provide research insights analysing patterns of absence and, counter-intuitively, can improve the quality of datasets through the concept of managed forgetting –asking is it important to preserve and is it relevant at the moment – we can better manage and find data. Alice Daish showed her work as a data scientist at the British Museum, with the goal of enabling data informed decision-making. This involved identifying data "silos" and "wrangling" data in to exportable formats, along with zealous use and promotion of R, but also thinking about the way data is communicated to management. Chris Williams demonstrated how the Alan Turing Institute handles data mining. He reports that about 80 percent of work on data mining involves understanding and preparing data. This ranges from understanding formats and running descriptives to look for outliers and anomalies to cleaning untidy and inconsistent metadata and coding. The aim is to automate as much of this as possible with the Automatic Statistician project. In a session on data policies, University of Toronto's Dylanne Dearborn and Leanne Trimble showed how libraries can use creative thinking to matching publication patterns against journal data policies in providing support. Fieke Schoots outlined the approach at Leiden which includes requirements from PhD's to state location of research data before their defence can take place and twenty year retention for Data Management Plans. Switching to journals, Ian Hrynaszkiewicz talked about the work Springer Nature has done to standardise journal data polices into one of four types allied with support for authors and editors on policy identification and implementation. Ruth Geraghty dealt with ethical challenges in retro-fitting a data set for sharing. She introduced the Children’s Research Network for Ireland and Northern Ireland. This involved attempting to obtain consent from participants for sharing, but also work on anonymising the data to enable sharing. Although a problematic and resource intensive endeavour the result is not only a reusable data set but informed guidance for other projects on archiving and sharing. Niamh Moore has long experience of archiving her research and focused on another legacy archive – the Clayoquot Lives oral history project. Niamh is using Omeka as a sharing platform because it gives the researcher control of how the data can be presented for reuse. For example, Omeka has capacity for creating exhibits to showcase themes. Community is important in both curation and management. Marta Teperek and Rosie Higman introduced work at Cambridge on collaborative communities and data champions. Finding a top-down compliance approach was not working, Cambridge moved to a bottom-up engagement style bringing researchers into decision-making on policies and support. Data champions are a new approach to seed advocates and trainers around the university as local contact points, based on a community of practice model. The rewards of this approach are potentially rich, but the cost of setting-up and managing it are high and the behaviour of the community is not always controllable. Two presentations on community/citizen science from Andrea Copeland and Peter Darch also hit on the theme of controlling groups in curating data. The Galaxy Zoo project found there were lessons to learn about the behaviour of volunteers, particularly the negative impact of a "league table" credit system in retaining contributors, and how volunteers expected to only contribute classifications were in some cases doing data science work in noticing unusual objects. A topic of relevance to social science focused curation is sensitive data. Debra Hiom introduced University of Bristol's method of providing safe access to sensitive data. Once again, it's resource intensive - requiring a committee classification of data into levels of access and process reviews to ensure applications are genuine. However the result is that data that cannot be open can be shared responsibly. Sebastian Karcher from the Qualitative Data Archive spoke about managing sensitive data in the cloud, a task further complicated by the lack of a federal data protection law in the United States. Elizabeth Hull (Dryad) presented on developing an ethical framework for curating social media data. A common perception is social media posts are fair use, if made public. However, from an ethical perspective posters may not understand their "data" is being collected for research purposes and users need to know that use of @ or # on Twitter means they are inviting involvement and sharing in wider discussions. Hull offered a "STEP" approach as way to deal with social media data, balancing benefit of preservation and sharing against risk of harm and reasonable consent from research subjects. Welcome to the second issue of Volume 40 of the IASSIST Quarterly (IQ 40:2, 2016). We present three papers in this issue. First, there are two papers on the Data Documentation Initiative that have their own special introduction. I want to express my respect and gratitude to Joachim Wackerow (GESIS - Leibniz Institute for the Social Sciences). Joachim (Achim) and Mary Vardigan (University of Michigan) have several times and for many years communicated to and advised the readers of the IASSIST Quarterly on the continuing development of the DDI. The metadata of data is central for the use and reuse of data, and we have come a long way through the efforts of many people. The IASSIST 2016 conference in Bergen was a great success - I am told. I was not able to attend but heard that the conference again was 'the best ever'. I was also told that among the many interesting talks and inputs at the conference Matthew Woollard's keynote speech on 'Data Revolution' was high on the list. Good to have well informed informers! Matthew Woollard is Director of the UK Data Archive at the University of Essex. Here in the IASSIST Quarterly we bring you a transcript of his talk. Woollard starts his talk on the data revolution with the possibility of bringing to users access to data, rather than bringing data to users. The data is in the 'cloud' - in the air - 'Revolution in the air' to quote a Nobel laureate. We are not yet in the post-revolutionary phase and many issues still need to be addressed. Woollard argues that several data skills are in demand, like an understanding of data management and of the many ethical issues. Although he is not enthusiastic about the term 'Big Data', Woollard naturally addresses the concept as these days we cannot talk about data - and surely not about data revolution - without talking about Big Data. I fully support his view that we should proceed with caution, so that we are not simply replacing surveys where we 'ask more from fewer' with big data that give us 'less from more'. The revolution gives us new possibilities, and we will see more complex forms of research that will challenge data skills and demand solutions at data service institutions. Papers for the IASSIST Quarterly are always very welcome. We welcome input from IASSIST conferences or other conferences and workshops, from local presentations or papers especially written for the IQ. When you are preparing a presentation, give a thought to turning your one-time presentation into a lasting contribution. We permit authors 'deep links' into the IQ as well as deposition of the paper in your local repository. Chairing a conference session with the purpose of aggregating and integrating papers for a special issue IQ is also much appreciated as the information reaches many more people than the session participants, and will be readily available on the IASSIST website at http://www.iassistdata.org.